Holy crap. This is like … Woodstock or something. And, the two day pass is $27 … yeah, that’s like free … only a little more than a yuppie food coupon, fer crying out loud! Who’s child do I have to sell to get to New York in Sept for three days?! Musicka Mystica Maxima [also,et,et] festival presented by Ordo Templi Orientis U.S.A. at Santos Party House, New York, NY. Two nights of musick made by practicing magicians or practicing musicians whose work celebrates the magical lifestyle, as well a public performance of ceremonial magic ritual. John Zorn and Bill Laswell added to Musicka Mystica Maxima! I thought I would post a reminder about this event in case you’d forgotten or might decide to attend. I’ve posted about this before, but It’s an extra chance to work with Thorn in addition to the weekend workshop. I’ll be making some great food for the signing after the presentation. If you’re feeling rambunctious, you could bring a potluck item to share and show off; but, there’s going to be a great variety of stuff including veggie sushi rolls and pizza, both handmade by me just for you … and, um, everyone else that shows up! SML members attend free. Others please contribute. Your contributions keep the lights on! Fri, Jun 12, 2009 e.v. 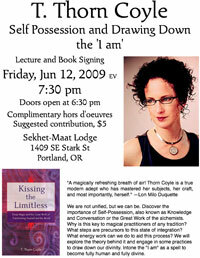 I posted before about the T. Thorn Coyle lecture and book signing at Sekhet-Maat Lodge on Jun 12th at 7:30pm. And now there’s a downloadable PDF flyer for the event which I just added to the event’s page. You can check out Self Possession and Drawning Down the ‘I am’ and download the flyer PDF over at the website of Sekhet-Maat Lodge. This is going to be a really interesting event, I think. It’s a chance to hear Thorn talk about her new book which makes strong connections between the idea of self-possession in Feri and the ideas in the western ceremonial tradition of achieving Knowledge and Conversation and the Great Work. When I first started hanging out at the lodge I kept thinking about how and whether to “cross the streams” at various times. Well, here’s a perfect example of what I wondered about. At any rate, it’s a chance to work with Thorn for people new to her books or long time practitioners. I’ve only had the chance to work with Thorn one other time for a weekend workshop, though her influence on other people I’ve worked with has been recognizable. Thorn is like a hot knife through butter. 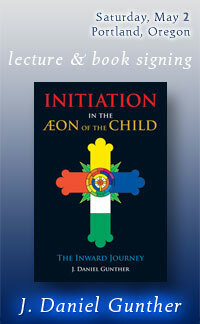 If you can make it to the lecture and book signing, I definitely suggest it. 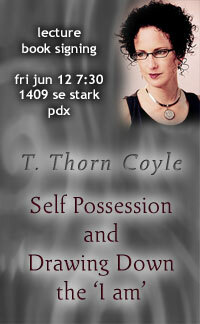 T. Thorn Coyle is going to be in town for a lecture and book signing at Sekhet-Maat Lodge on Jun 12th at 7:30pm. T. Thorn Coyle is an internationally respected teacher. A spiritual seeker her whole life, she has studied the craft of magic for more than twenty-five years. Thorn combines her esoteric studies and work with her Gods and Guides to form a practice that honors the fertile dark and the limitless light. Mystic, musician, dancer, activist, and author of Evolutionary Witchcraft and Kissing the Limitless, she makes her home near the San Francisco Bay. We are not unified, but we can be. Discover the importance of Self-Possession, also known as Knowledge and Conversation or the Great Work of the alchemists. Why is this key to magical practitioners of any tradition? What steps are precursors to this state of integration? What energy work can we do to aid this process? We will explore the theory behind it and engage in some practices to draw down our divinity. Intone the “I am” as a spell to become fully human and fully divine. _Kissing the Limitless_ is a manual for self-liberation through magic, providing a complete system of spiritual practice to help serious seekers tap the unlimited possibility of their own divine natures. By practicing the Great Work of the ancient alchemists and magicians, readers are guided into self-possession—constant communication with their divine selves—and connection with the Limitless Divine. Set up as a detailed training course using contemporary techniques that echo those hinted at in antique sources of wisdom, it includes tools for soul balancing, energy cycling, shadow and dream work, tarot and meditation. Readers will learn to open up “life power” and access breath, will, and desire—the key components of effective magic—to reshape the world. This book is a synthesis wrought through many years of Coyle’s personal spiritual work, her teaching, and deep esoteric study. Though Kissing the Limitless has entry points for beginners, it is primarily designed for the advanced magical practitioner wishing to ‘Know Thyself.’ Wholeness and union with our own God Soul, also known as our Genius, our Authentic Self, or our Holy Guardian Angel, is within our grasp. We can become fully human and fully divine in this lifetime. Feast on a substantial selection of complimentary hors d’oeuvres and non-alcoholic beverages. You’ll also find wine and beer available for purchase. Sekhet-Maat Lodge will have a selection of items for sale, including Kissing the Limitless and Evolutionary Witchcraft by T. Thorn Coyle, other relevant titles, Abramelin Oil, mugs, stickers, SML lamen t-shirts, posters, and more. I put up a major update over at the NOTOCON VII website today. The full schedule is online, with a spiffy jquery popup for presentation information. Anyhow, time to start planning on which presentations to attend! both are witness to this declaration. for having partaken of communion. I see yet another approaching dawn. the lord of afterlife resurrected. has in the sky the other stars rejoined. to fulfill his true will while on the earth. 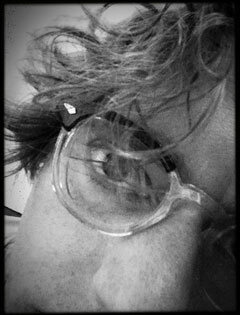 I was thinking about a project for myself. I was going to check the Stèle of Revealing and figure out the best modern translation of the hieroglyphics into my own interpretation. Well, I forgot about the modern transcription of the Stèle in the back of The Holy Books of Thelema. So, I took that and did the rest of the project. I didn’t go to The Book of the Dead and use the passages that the text of these things is based on, but that is something I could do. I started with two additional ideas. The first is that for egyptian art, images are also fully meaningful words. This is based on ideas from Reading Egyptian Art. The second is that I wanted to tease out the meaning of the names of places and entities instead of leaving them opaque. So here’s my notes, which I didn’t do a great job of keeping track of my sources; since this is mostly an artistic project. But, I may want to go back at some point fill that in with good ones. I honestly didn’t get too strict about where I got my information from if it seemed mostly reasonable to me. Well, there was a slight hiccup for the online vending application. If you used the online vending application before Feb 11th, please re-apply. There were technical difficulties with the tool in the form of me making a typo and not testing after making changes to the config. However, there’s now also an app for those interested in volunteering on the contacts page, and a note about volunteering from the Onsite Assistant. Vending will be open throughout NOTOCON VII. Please continue to watch this page for further vending related updates. Currently, the vending application process is open, and will be open until full. We will first begin accepting initiate vendors on February 1st. If there is still space available, we will then open to non-initiate vendors on April 1st. Things are starting to hop quite a bit more, as NOTOCON is just around the corner now. The eighth annual Thelemic Symposium at Sekhet-Maat Lodge has been announced. It will be on Mar 28, 2009. Doors open at 6:30pm. Thelemic Symposium is a panel discussion and question/answer session engaging the considerable experience and knowledge of three long-time Thelemites. We are proud to present this, the eighth annual Symposium, featuring panelists Eliza McBryde, Michael Kolson, and Dathan Biberstein. Thelemic Symposium VIII – Sekhet-Maat Lodge – March 28, 2009 e.v. There’s a bunch new over at the site for NOTOCON VII today. I put up the speakers and presentations information. So, you can check out some of what’s going to happen over the conference. The formal schedule and vending aren’t up yet, so there’s more to come. But, there’s definitely several of the presentations I’m interested in, and a couple of those I won’t be able to go to … C’est la vie! Also, even more importantly, registration is now open. There’s a couple of first-come, limited-capacity events that one can choose to attend as part of registration, but only one of them I can actually go to. Still, it looks like there’s going to be quite a lot going on that will be interesting. There’s a post now over at the official NOTOCON VII Blog about registration being open. I think there’s going to be something posted to the blog about the speakers and presentations soon also. I made a big update to the root NOTOCON ~ National Ordo Templi Orientis Conferences sited today. I’ve had this mostly ready for a while, but had some last minute changes to make, was waiting for the AIT site to be up, and needed final go-ahead. The update features archives of all previous NOTOCON sites for which a site existed. There are two stubs for the earliest NOTCON events, which I hope to fill in with more information as I collect it. Also, I’ve started the cross-promotion of sites. So, this update includes links to both the new AIT and the already existing Kaaba sites. And, over at the new AIT site, I’ve added cross-promotion to NOTOCON and Kaaba in the sidebar. The new website for Advanced Initiator Training is up now, in advance of the event at Knights Templar Oasis in Salem, MA on Mar 14-15, 2009. Registration for AIT 1 is now also open for those that can attend. The site design is supposed to look very much like the site for the Kaaba Colloquium: Thelemic Leadership Seminar, but this site is much less back-end heavy and has some other small changes. Eventually, I hope to have cross-promotion between AIT, NOTOCON and maybe even Kaaba. These various O.T.O. events are all examples of a desire for excellence. Last week I completed some promotional graphics for Sekhet-Maat Lodge to help people spread the word about the weekly celebration of Liber XV: The Gnostic Mass [also] every Sunday at 3pm. I posted the final images to the Lodge’s promotion page. There’s actually three versions on the promotions page, including one for social networks and one for rich-text e-mail signatures. You can check out the various drafts I went through, starting with a pretty lame first draft, over here.